A native of Los Angeles, Miles Corwin spent the first years of his life living with his family in the Rosslyn Hotel, which his grandfather owned, located at 5th and Main streets in downtown Los Angeles, at the edge of Skid Row. He graduated from University of California, Santa Barbara and received an M.A. at the University of Missouri School of Journalism. He spent more than five years as a Los Angeles County beach lifeguard. 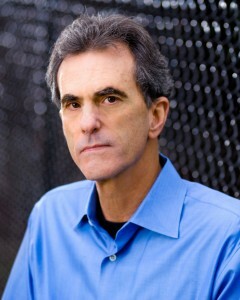 Corwin, a former crime reporter for the Los Angeles Times, is the author of three nonfiction books: The Killing Season, a national bestseller; And Still We Rise, the winner of the PEN West award for nonfiction and a Los Angeles Times Best Book of the Year; and Homicide Special, a Los Angeles Times bestseller. Turning his attention to fiction, Corwin’s first novel, Kind of Blue introduced Detective Ash Levine, L.A. Felony Special unit. Corwin’s hard-earned insider knowledge of homicide investigations and his familiarity with the seamy side of L.A., gives his crime fiction spot-on realism. Kind of Blue was named a Top Ten Crime Novel by Booklist in 2011. Midnight Alleyis the second book in this adrenaline packed crime series featuring Detective Ash Levine. Corwin lives in Altadena with his family and teaches at the University of California, Irvine.